I have recently watched two different films entitled “The Story of Tea”, which both present the facts of tea and tea history in different ways. Both films have their own merits, so if you are a crazy tea enthusiast like myself, I recommend watching both. If you are just looking for a general overview of tea in movie form, either film will probably serve your needs. The first film I watched was “The Story of Tea” from the Planet Food Collection. Of the two films, this was the slicker, more hip production…or as they say in the film, an “epic story of tea…empire building on a grand scale.” It features an assortment of young, attractive hosts at tea hot spots around the globe, creating the feel of an infotainment news special. 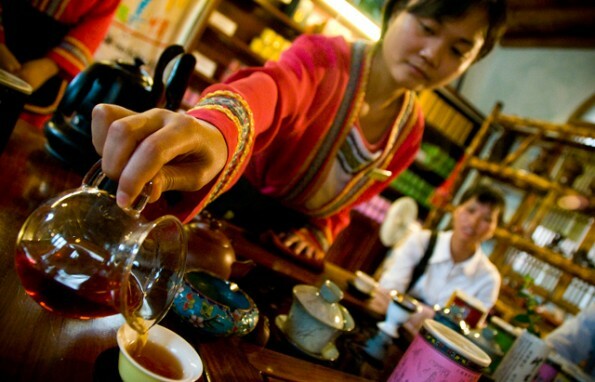 Very watchable and engaging, Planet Food’s “The Story of Tea” seems geared toward a younger audience. It really helps to generate a sense of excitement about the world of tea. The Story of Tea: The History of Tea & How to Make the Perfect Cup is second film that bears the title, “The Story of Tea.” This particular film is a 57 minute documentary that goes into detail about the various methods of serving tea around the world. This film is just as informative as the Food Trekker version, but with a more subtle presentation style. The narrator is much more mellow than the hosts of Food Trekker’s “The Story of Tea”, making this film an ideal choice for a more relaxed viewing experience. Both versions of “The Story of Tea” are informative and entertaining, so choose one to suit your mood, brew up your favorite cup of tea, and enjoy!